I’ve always wanted to make a coffee table out of an old wood palette. However when our big screen TV died and I brought in our little flat screen from the travel trailer, I knew we needed a new stand for it. I had this wood palette sitting in my garage I found only a few short weeks ago just begging for the right treatment. And it was the perfect size for what was needed. 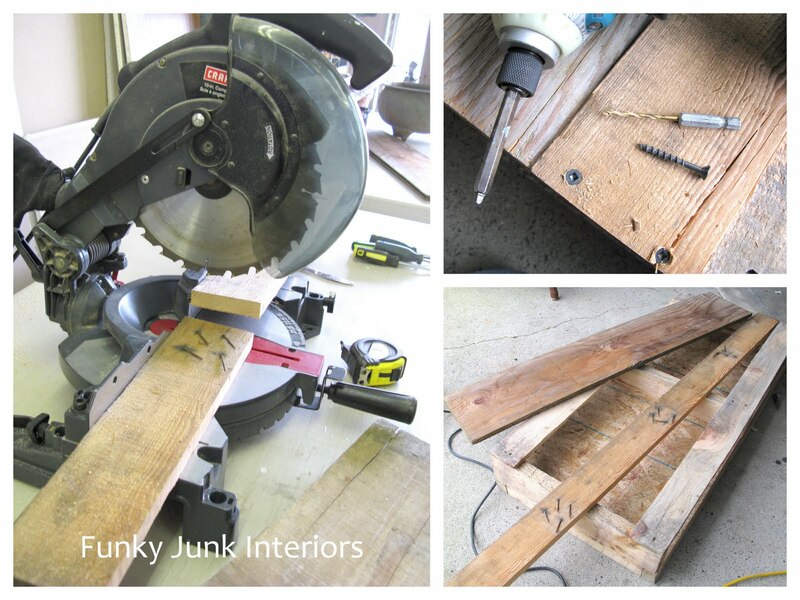 So thanks to So You Think – Junk Edition, the build began! The wood was pretty rough, so sanding it like crazy with a palm sander was a must! Do you like my workshop? I loooove working outside! And then absolute panic set in. I had no idea how to build LEGS. I am not a builder! I grabbed every single piece of scrap wood I had and paced. And worried. And propped. And failed. And then snapped this mayhem kind of picture to try and forget my crazed mind frame. 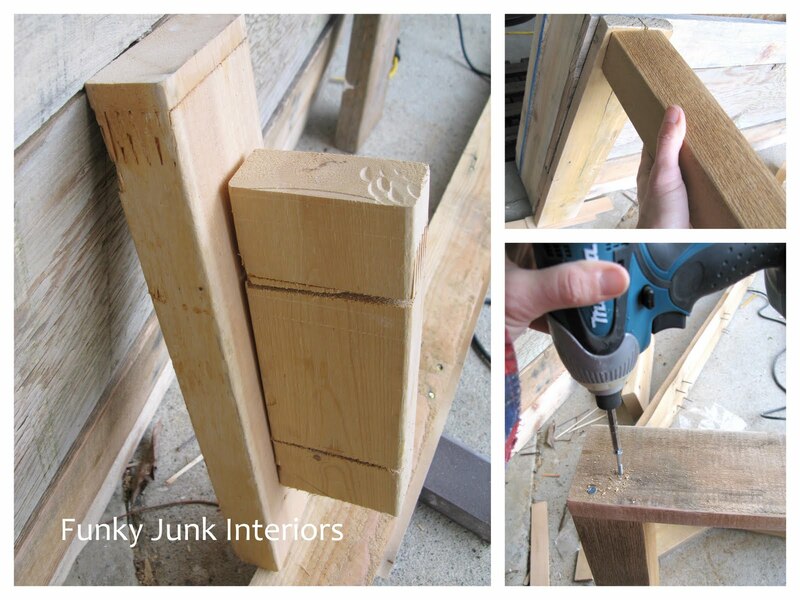 And then when I found two chunks of wood nailed together (top left pic), the light bulb came on! I cut legs, attaching them to a board on their own, THEN screwed the leg/board combo onto the bottom of the palette. And then I funked up the side and back supports with three different treatments on the legs. 🙂 Funkalicious! … a display case out of the top! I already had a piece of glass in my storage stash that fit PERFECTLY. The weight of the TV is supported by pieces of 2×4’s placed underneath the glass. Sneaky, eh? The leg height was designed so the authentic crates underneath could be used for movie storage bins. And there she is! The old palette TV stand. And the two openings under the top? They were the perfect size for the TVand DVD components. Amazing. It is VERY cute! I think as a coffee table you would get to see all of the great stuff you displayed in side more, but it is GORGEOUS! Girl…I don’t ‘think you can decorate’…I KNOW YOU CAN!!! I love this piece! You KILL me! I swear, I can’t believe the things you come up with, and how absolutely fabulous they always turn out. What a great project!! I hopped right over there and voted for you. I love the shutters too!! Creativity is your middle name. Looks great!!! That’s crazy! Please come over and help me. Yours are always my favorite because they are so fun and unique…but how do I vote???? #7 Elizabeth, click on the So You Think You Can Decorate button at the bottom of my post and it’ll take you to the voting blog. Wow! What an incredible project. Hope you make it all the way to the end of the competition. I’m just in awe. Someday I hope to have a Funky Junk original in my home! You’re amazing. So funky…hey wait a minute, isn’t that your middle name!! So creative. you go girl! Oh! Girl, you have more than your fair-share of creativity. Junk on! Wow! You never cease to amaze me! I love your builds so much I don’t know what to say! My family is starting to think I’m crazy ’cause I keep talking about this woman on the internet who does these great projects (blush) Sorry 🙂 – keep up the wood-working – I think these projects are the bomb! Holy cow lady…that is amazing. Seriously amazing, it is absolutely perfect. “And then I funked up the side and back supports…” OK I read that really fast and gasped for air!!! Went back and re-read it and roared laughing! Alright. Enough. That table and all the PERFECTLY’s you had happen! Enough, I say!!!! If you, are you listening? Do you hear me? You know what my voice sounds like now!!! If you, don’t call or write or send or forward this to a mag….I’m flying to BC and making you do it, with sugar on top!!!! I love it! I love that YOU made it! I love that I know you. I know you, right? Seriously. (I can be serious – for 5 minutes). This is not even funny anymore. You are off the wall, the beaten path, the sky’s the limit CREATIVE!!! And the thing that really trumps me is that it’s not like you’re sitting around and don’t have anything else to do. That’s what really gets to me!!! I can’t even paint a “funking” closet. It’s taking me weeks!!!!! Weeks, I say!!!!!!!!!!!!!!! This is awesome Donna!! You are so freaking talented I cannot stand it. I want to fly you out to do my stairs going down to our family room… Have a great week! Oh my gosh!! What a crazy, wonderful project!! It is fabulous! I love everything about it. And having that display under glass is terrific!! Well done! I’m a “real woodworker” and I didn’t skip down to the end. Your legs are just fine because you have support for them with the side and back pieces. Plus… it’s supposed to look funky, so you did a fabulous job! Ummmmmmm, Donna? Do you wanna be my new BFF?? I mean we have ALOT in common….You make the stuff, and I lurve it. A lot. Just saying…. I AM BLOWN AWAY! This looks so absolutley FABULOUS! And the glass top…way too super cool! I love your crates underneath and the two different sizes and the various woods…LOVE it ALL! Donna,Donna, Donna.. How in the world do you make all this funky junk look so great in your home? We laugh here about haydite block bookshelves and cable spool coffee tables being in our living room, like redneck fashion…and you make RED-NECK look good! Not to mention the zany crazy comments you get from people like Kolein– Hilarious! You have started a junker’s revolution. First off, I cannot believe I got a high 5 from a real woodworker! OH. MY. FAKE. WOODWORK. SKILLS. I’m elated! The unit is indeed super sturdy. I couldn’t even rock the thing. SIMPLY TO DIE FOR!I LOVE EVERYTHING ABOUT IT! 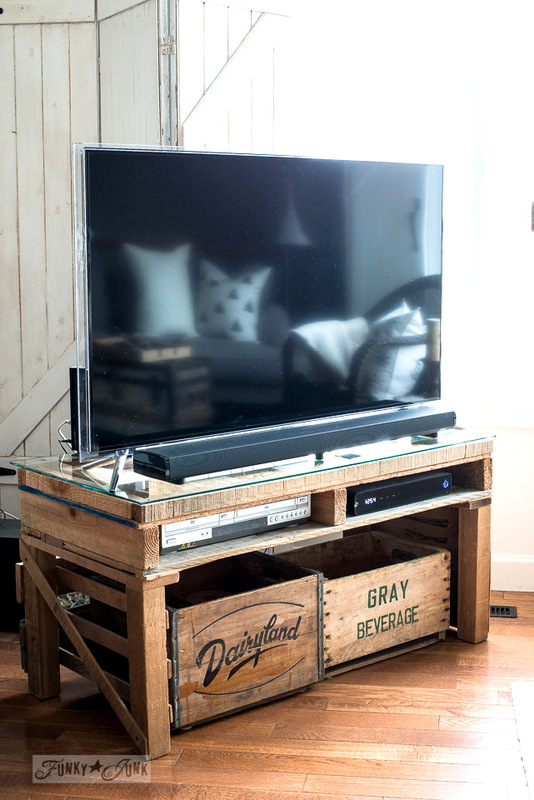 VERY CLEVER HOW YOU ADDED THE WOOD TO SUPPORT THE TV! OH TO HAVE YOUR TALENT !!!!!!!!!!!!!! Donna,you are amazing!! I absolutely love what you made! LOVE IT!!! I think it is especially great that you didn’t feel compelled to paint it and it fits in perfectly with the theme and your decor. Great job. I can’t wait to do some things like this to my first place. And your post has just inspired me to write a blog post of my own, so check my page later today to see your site linked. So great!! So very cool! 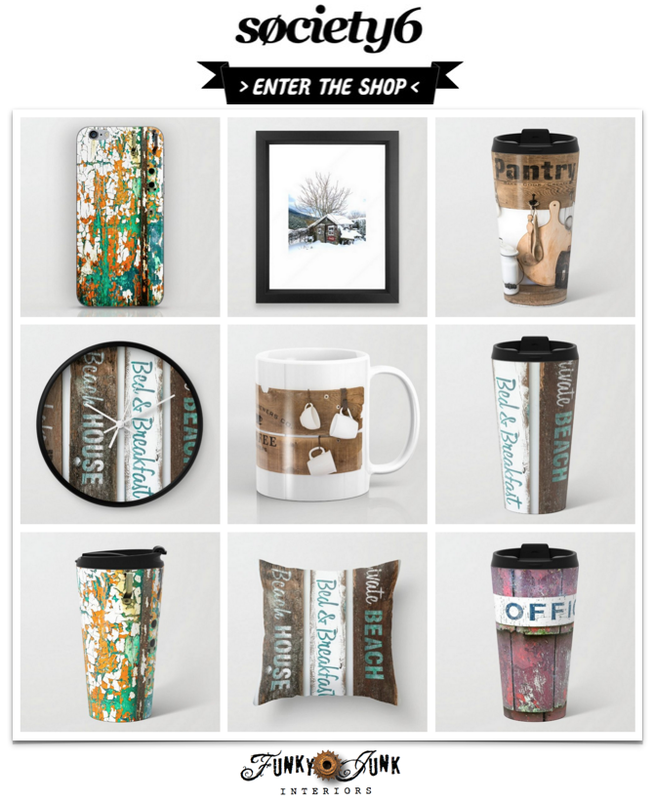 !~ I love your rustic style! You’re my hero! There are SO many things I love about your house and this new TV stand is definitely one of them. (I recently used your material-on-a-hanger-as-a-window-treatment idea. Love it!!!) Thanks for the inspiration! WOW! How did you come up with this! You really are so amazing!! Yes… go get some metal stamped labels!! This TV stand is an original, and so much fun! In fact, I love the “Funky Junk” look in the whole corner that you shared of your living room. So very creative!! Oh my goodness, you are brilliant. I have seen crate tables everywhere but this one is genious! These challenges really get you moving, don’t they! donna, you did it again! amazing work! it pairs well with your shutters and i just LOVE the display top! i didn’t get the chance to comment on your new staircase… all i have to say is YUM!!!! Wow this is awesome! You come up with the neatest things! I am hosting a “Saturday is Crafty Day” party on April 24th and I’d love it if you stopped by! WOW! what a fabulous job you did…smiles. That is the funkiest junk I ever saw! Awesome cool! Can you be any more amazing??!! This is FANTABULOUS!!! I want one! You have a brilliant mind Donna! You are the junking Einstein! And it all works so well in your home! We can’t find our tin snips, seeing them in your tv stand reminded me of that. You do have fun when you build things. Hope you do some new stuff to show off. Hi, Donna! I love how you used your pallet!! Really gets me thinking!! And I have access to an unlimited number of pallets…. I could be busy for a while!!! 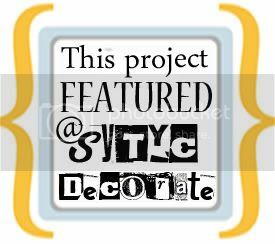 I posted this project on my blog! Please come visit if/when you have a chance!! I love your blog and just found this post! Love, love, love it! This is exactly what I need for our flat screen tv and refuse to spend $100-$200 on one. You are so talented…and an inspiration. Keep the wonderful ideas and posts coming!! Ok, this is too cool. I am going to try to make one! What are the dimensions of your one? oh this is great…love the display! 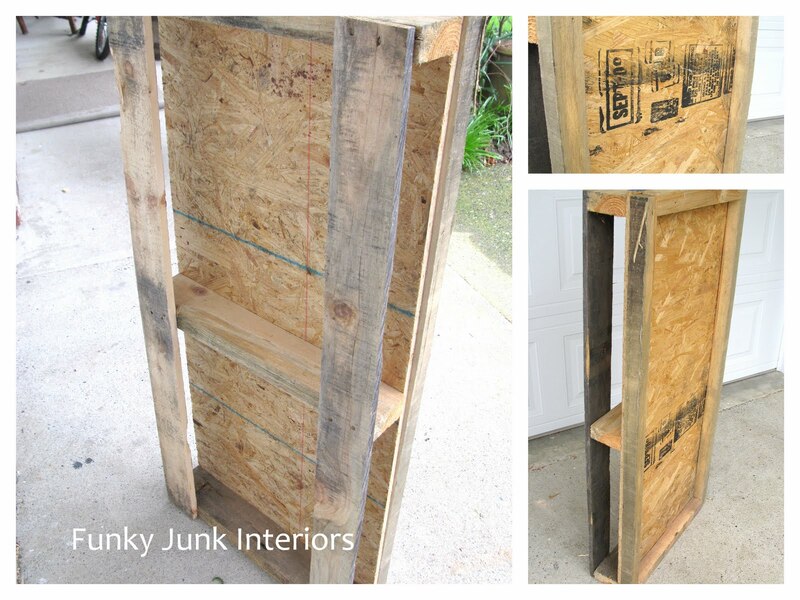 Great idea for repurposed wood and using old boxes, crates etc. Advertising on boxes gives an added dimension and decoration in a room! Love the ideas. Very creative and useful Donna! 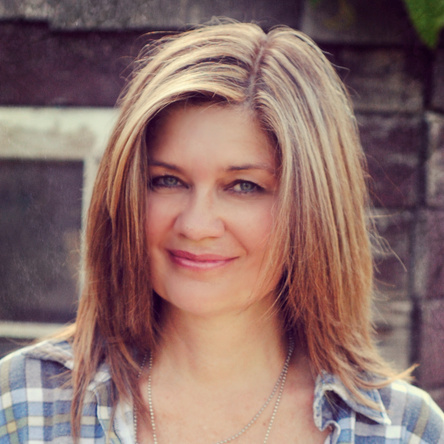 I found your blog through Pinterest and really like your projects and makeovers. I noticed the yard stick…we might shop the same thrift junk stores! You beat me to it! 🙂 I’ve also added the link in the post too. Can’t wait to build this for our home(Not a builder)… SoO perfect. Thank you. hi i really like the tv stand you built. it looks awesome , great job !! Really cool job! I have been looking for a tv stand to use as an amplifier stand for my guitar amp. I also need some storage space for pedals, books, cords, and other things. I have a couple of heavy duty pallets downstairs and I am thinking about heading down there to try to see what I can come up with, thanks for the inspiration! love this project, went out and found pallets yesterday, one question, what was the height of the finished project. How about that fireplace?! Did you make it? 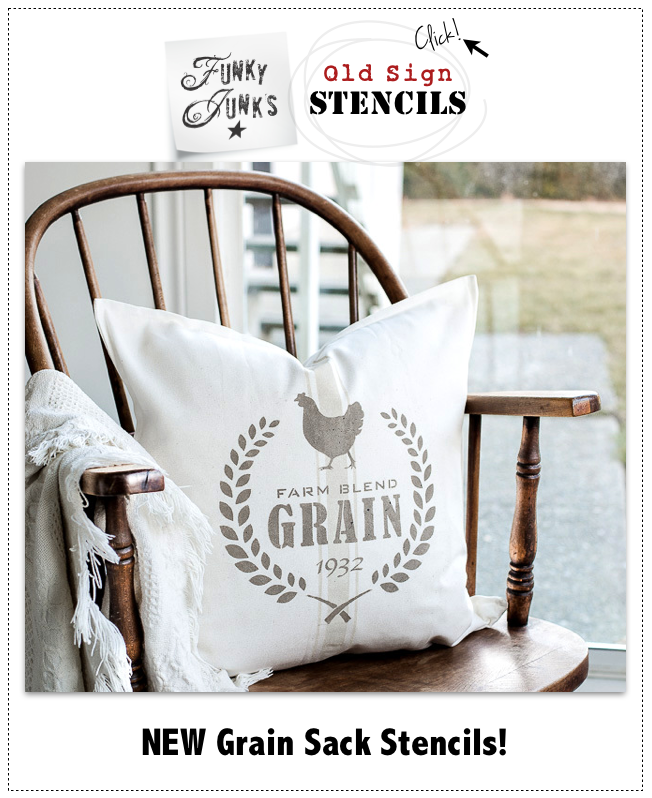 It is exactly what I want to make in my 100+ farmhouse (that the previous owners remodeled into a 4 room box house in the 1970’s by taking off the 2nd story and enclosing everything, everything! in fake wood paneling). I’m loving this website and am finally inspired that I can revive my home back to what (I imagine) it was 100 years ago even though I have no extra cash. Love what you do! Hi Donna. I am Marian’s Brother. (MMS) I was doing a google search for TV stand ideas and noticed this project. I love the idea! Thanks. I totally love this TV table,it’s relaxed and trendy! Super job! !